What's being under reported is the extent to which it blows out the water some major claims of the anti-immigration lobby. BBC News is running today with a story that low-skilled workers are “at risk of exploitation because of lax labour laws, a report has warned”. The report they are referring to is by the government’s Migration Advisory Committee and came out this morning. The BBC is leading with, as mentioned, fears about employers exploiting the low paid and the need to properly “manage” further EU expansion. No prizes for guessing how this will be interpreted by the right-wing press tomorrow. Certainly it’s sensible to address any concerns that have come up in the Committee’s investigation, but what’s being under reported is the extent to which the report blows out of the water some bread and butter claims of the anti-immigration lobby. About 15 per cent of the UK-born working-age population claimed out-of-work benefits in February 2013. 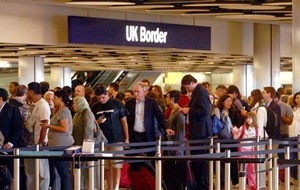 The claim rate for migrants was 6 per cent – less than half the UK level. Jobseekers Allowance (JSA) and Employment Support Allowance (ESA) were the main benefits claimed by migrants (between 65 per cent and 82 per cent of the total). Read the summary report, and the full report. UK Citizens who leave the UK for more than 3 months are no longer entitled to free NHS treatment but many of these ex-pats return to UK for free NHS treatment then leave again. These people are rarely asked to pay for their hospital treatment but they are by far the most numerous NHS tourists. Ooops, sorry. I should have said that if the UK Citizen leaves EU. They retire abroad (outside EU) and when they become ill they say they have resettled in UK until the treatment is over, then bugger off back to their retirement village abroad. One French banker with a large bonus will boost the average returns for EU immigrants. It is wrong to consider the average position, when there is clearly a big spread. Obviously we don’t let in enough US bankers to offset the costs of the low earning non EU immigrants. If you wish to consider the economic impact of individuals, you must do that individually (or at least by considering groups of people of similar economic impact), not by hiding it by lumping them with a whole lot of other people with a very different impact. The impact of immigration on benefits is at least in part that UK nationals have been displaced from the workforce by immigrant labour. It is an indictment of the education system that foreign workers are often preferred to British ones. The report also suffers from ignoring the known problems with the data on immigration. I don’t think it proves anything much when it ignores 346,000 A8 nationals now reckoned to have escaped the statisticians. No. They paid into the system their entire lives and have a degree of entitlement. Since they are retired and not earning, they wouldn’t pay anything anyhow. Expats who are working in Germany etc. are paying into the German system and would have no reason to return to the UK for health services. The report specifically states this doesn’t happen. Evidence is needed for this assertion. In the real world employers will readily employ natives if they are available. There is no preference for foreign workers at all. Nevertheless these are the people that account for the majority of the “Health tourists” described by David Cameron. I agree that they have paid in for many years but since they are not resident in the UK they are not “entitled” to free care so they show up in the figures. Those still resident in EU are still entitled to free care via the European Health Card so if they were in Germany they could get free treatment there and return to UK still entitled to free NHS. Evidently you don’t read. I have looked at the full report. 4.8 Academic attainment, work experience and soft skills all play a role in determining a young person’s access to employment and training opportunities. Basic qualifications, especially English and Maths, are important for their employment prospects. Evidence from Wolf (2011) and the Organisation for Economic Co-operation and Development (OECD)’s adult skills survey suggest that the skills of young people in these areas are placing them at a disadvantage in today’s labour market. the UK labour market for low-skilled jobs, and may put them at a disadvantage if competing with migrants. Also see Table 4.1 which show quite clearly that foreign workers have gained at the expense of UK ones in low skilled occupations. This is supplemented by the further data showing high labour force participation rates for lower skill A8 nationals, and a deterioration for UK lower skill nationals. Things may be OK for the middle classes with degrees, but that is not the case for the less skilled. No, of course they don’t. They might think, and that might damage a perfectly good dogma. The rules are that they are not entitled. They are showing up in the statistics as a result, and this is then being blamed on the “immigrant”! Inference which does not have any data behind it. You’re cherry-picking to support your dogma. Ah yes, “reckoned”…i.e. you’re making it up. And of course you exempt your 1% from the myths, THEY have to be free to travel after all, even after you’ve blocked everyone else from crossing that border! No end to the myths you’ll chant. I suspect he has a rather clearer insight. I take his “views” at about the same level as the Mail’s. Moreover, I take evidence before any opinion. That he sees people as “lower classes” says SO much, as the article ignores the evidence and rants on the same old “blame the immigrant” game. More, I fully believe that he’s talking about dropping wages again – sharply. It fits his policies.